This summer, I invite you to join us at the Newberry as we read and discuss three comedies written by Nikolai Gogol (1809 – 1852), a supreme playwright whose comedies are the funniest in the Russian language. While the force and originality of his imagination influenced generations of writers and the subsequent development of Russian theatre, the achievements of Gogol are more than national. The universality of his vision, and his ability to depict a society dominated by petty bureaucracy and base corruption and transmute what he saw and understood into language of the utmost originality, combining the fantastic, the satiric, the realistic, and the grotesque with the romantic and the tragic, have created for him a permanent place in world literature. The seminar will include both presentations and group discussion. 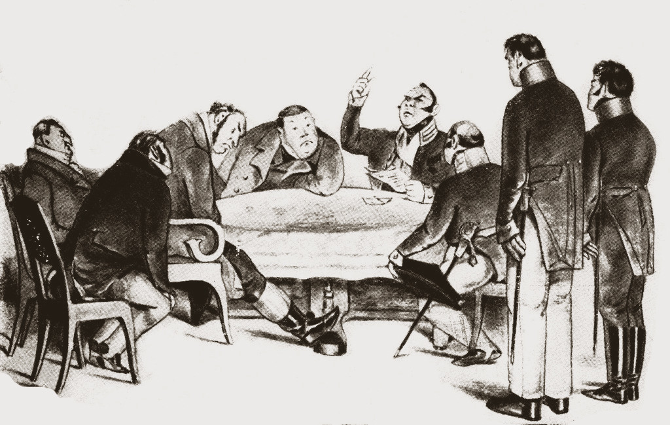 We will focus on close textual analysis of Gogol’s plays The Gamblers, Marriage, and The Government Inspector over a period of four meetings, supplemented by biographical, historical, and critical information related to the writings. During the sessions, several short episodes (not longer than 10 – 15 minutes each) will be shown from Russian films based on the comedies. We will meet on Saturday mornings from 10:00 am to noon starting on June 15, 2019 and ending on July 6, 2019. Sign-up will take place on the Newberry’s website later this spring. Sign up begins on May 7, 2019. (I will post the link when it is available.) To read the complete seminar outline, including the reading assignments, click here. I look forward to exploring Gogol’s comedies with you!